This profile was sent in by John McCall-Peat March 2011. The two persons in which I have the greatest interest are the grand daughters of William McCall (1799), Jessie Meuros Peat and her sister Mary King Dalglish (Peat) whose brother, Samuel McCall Peat came out to South Africa (Port Elizabeth), fought in the Boer War and later married, in South Africa, Mary (May) Davidson (born in Aberdeen). Samuel hyphenated his second forename thus creating my family surname McCall-Peat. 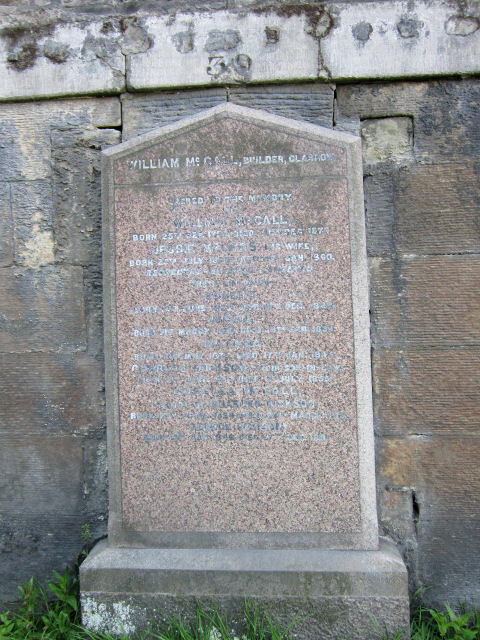 William McCall Born 1799 Died 30 December 1871. Father of Margaret McCall who married John Peat. 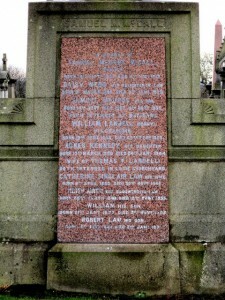 Their son born 1866 was named Samuel McCall Peat. He settled in South Africa and married Mary Smart Davidson. 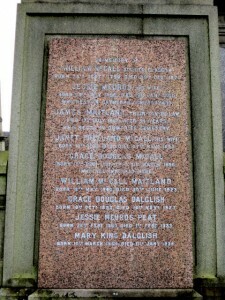 They had 6 children whose surnames were shown as McCall-Peat. Their first child was born in 1900. The family appears to have been prosperous, as the residential addresses appearing in the various censuses are in very desirable areas. Further the cost of this type of memorial would have been fairly expensive. Rottenrow St Mungo District Glasgow. The following are extracts from the will of William McCall. Builder and Wright and the founder of William McCall & Sons Glasgow. The spellings are exactly as shown in the will. 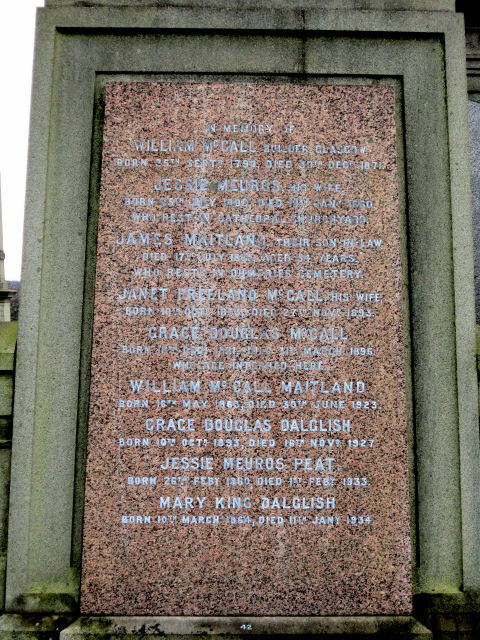 ….who died at Dahlandhui, Gareloch, Dumbartonshire on the 30th day of December 1871. ……deceased houses number 25 Richmond Street Glasgow. Dahlandhui, Rockville and Carloch on the Gareloch,Dumbartonshire. …….to my eldest son the said Samuel McCall all and whole the plot of ground with the house or villa built thereon and offices and pertinents thereto belonging called Dalandowie, situated on the Gareloch being part and portion of the lands feined by me from his Grace the Duke of Argyll in the Parish of Roseneath and County of Dumbarton. …..to my second son the said William McCall that plot of ground with the house or villa built thereon and offices and pertinents thereto belonging called Rockvalley and situated immediately to the north of Dalandowie being part and portion of the lands feined by me from his Grace the Duke of Argyll. 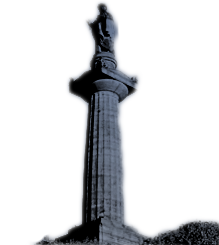 ….to my youngest son Archibald Grieve McCall that plot of ground with the house or villa built thereon and offices and pertinents thereto belonging called Carlochvale being part and portion of the lands feined by me from his Grace the Duke of Argyll. …hold in trust in their names for behoof of my Daughters ..…… the following tenements belonging to me situated in and forming part of the said range of buildings on the north side of George Street of Glasgow called Graham’s buildings……on which several lots the deceased John Graham erected four large tenements of land fronting George Street…..the west most tenement of said range of buildings at the corner of George Street and Deanside Lane…my eldest daughter Grace McCall. 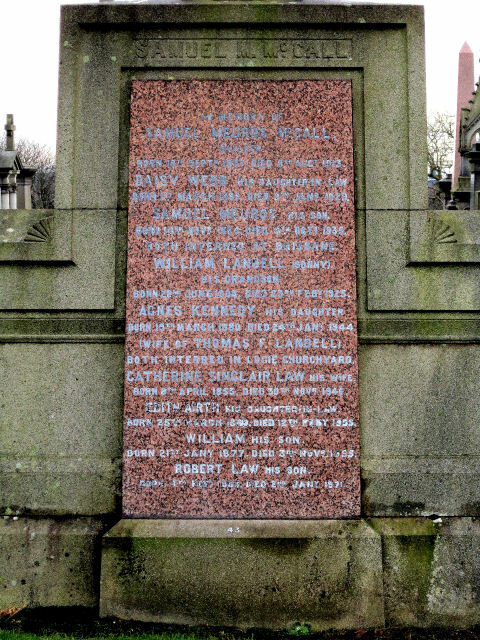 ….the remaining of the east most tenement of the said range being the tenement on the corner of George Street and Balmanno Street….my daughter Mrs Janet Freeland McCall or Maitland…. …to hold the property in Glassford Street possessed by my tenants Messrs. Wilson & Matheson….. 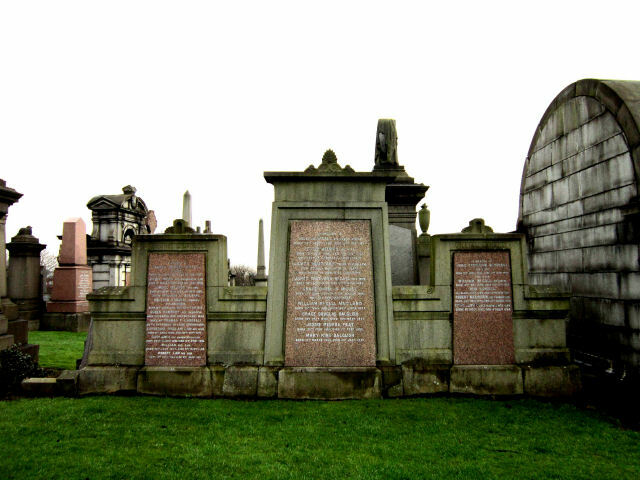 The stone is a very large 3 sectioned stone with pink granite panels and lists around 23 other family members, some of the people listed are obviously not buried there, but the area/width it covers is the equivalent of at least 4 lairs (e.g. approximately 12 feet wide, allowing for the burial of at about 16 individuals). The stone sits right at the top of the Necropolis in Section Zeta and because of the size of the stone, it can be seen quite clearly looking at an aerial view. Who rest in the New Cathedral Churchyard. SAMUEL MEUROS his son, born 14th November 1884, died 4th March 1935 (50), both interred at Brisbane. (Wife of Thomas F. Landell) Both interred in Logie Churchyard (Stirlingshire). 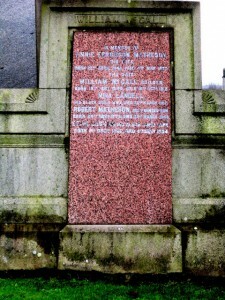 William McCall Stone – New Cathedral Churchyard.